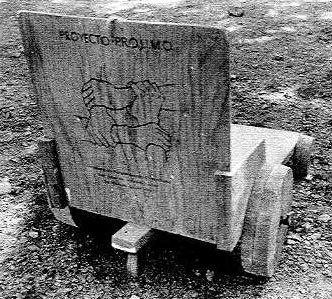 Many of the innovations described in this book were developed at PROJIMO, the village rehabilitation program in the mountains of western Mexico. As we explained in the Introduction, the program is staffed mostly by young disabled villagers. Because you wiil meet PROJIMO team members in various chapters, we thought you might like to know a bit about them. Most come from poor families and have lived through very difficult times. They first came to the program for their own rehabilitation, then decided to stay longer, learn new skills, and work together to help others. Many speak of their experience at PROJIMO as a kind of liberation or even a "return to life." Each has a fascinating story. Here we will say only a few words about some of the key members of the team. MARI AND ARMANDO. Mari Picos is one of the coordinators of PROJIMO. She was paralyzed from the waist down (paraplegic) in a car accident on her honeymoon. For two years she stayed in a dark room, unwilling to accept her disability or use a wheelchair. Twice she tried to kill herself. She was first taken to PROJIMO against her will. But in the course of her own rehabilitation, her heart went out to some of the disabled children. Eventually she became one of the leaders and organizers of the program. She became skilled at evaluating disability needs, peer counseling, brace-making, and at treating medical problems such as pressure sores, urinary infections, and epilepsy. 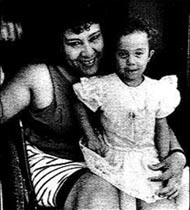 She married Armando, now runs her own home, and they have a delightful daughter, Lluvia (meaning rain). Armando Nevérez had polio affecting all four limbs, Doctors said he would never be able to walk. But they were wrong. PROJIMO helped him to get surgery and to begin to walk with leg braces and crutches. Armando became a skilled brace maker and now runs the wheelchair shop. He married Mari and usually treats her as an equal (which makes him exceptional in more ways than one). CONCHITA AND MIGUEL. 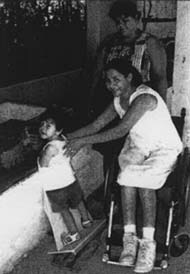 Conchita Lara became paraplegic from a fall when she was a teenager. For 4 years she was totally dependent on her family and very depressed. At PROJIMO, in her words, she "returned to life." Today, with Mari, she helps coordinate the program, makes artificial limbs, and does the program's accounting. She married Miguel Zamora, who is a driver and handyman for the program. They have two lovely children. 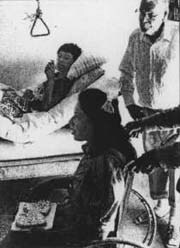 Conchita's story is told in Chapter 42. IRMA AND JAIME. 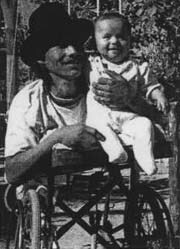 Irma Llavió had polio as a baby. With all four limbs affected, she spent her childhood and adolescence crawling about on the floor, and she never left home. 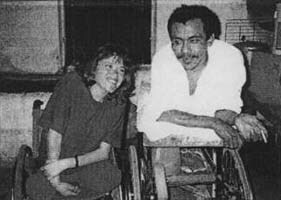 She was brought to PROJIMO by Martha Heredia, a leader in Mexico's budding independent living movement. For Irma, getting her own wheelchair and being with a group that treated her as an equal was liberating. She runs the kitchen, works in the toy shop, and helps her boyfriend, Jaime, in the wheelchair shop. Jaime Torres, who is paraplegic and rides a wheeled cot because his hips are fused straight, has been working at PROJIMO for 6 years. For the first years he was chronically depressed, and sometimes he was drunk for days at a time. Then Irma arrived, and Jaime's spirit revived. 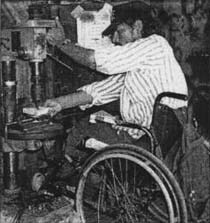 He has become a master welder and wheelchair builder. MARCELO. Marcelo Acevedo is one of the founders and leaders of PROJIMO. He had polio as a baby. Since his early childhood, the program has helped him with braces, crutches, and schooling, and trained him as a village health worker. He has become a very skilled, innovative brace and artificial limb maker, as well as a welder and wheelchair maker. Marcelo is one of the main trainers of others in these skills. I (the author) have Marcelo to thank for walking as well as I do today (see Chapter 11). Good-willed and gentle, Marcelo is often the peacemaker when conflicts arise. Marcelo (on the left) teaches Armando to make plaster molds for braces. INEZ AND CECILIA. Inez Leon has one leg paralyzed by polio but is incredibly strong. 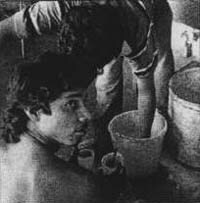 Having grown up as a street child, in his teens he was brought to PROJIMO, and stayed. Trained in a hands-on way by Ann Hallum and other physical therapists, Inez has become a skilled therapy helper. After a long courtship he and Cecilia married and now have two little girls. 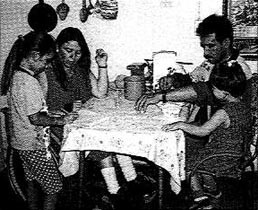 Cecilia Rodriguez, who also had polio and uses a wheelchair, tutors disabled children and teaches them arts and crafts. MARIO. Mario Carrasco was born in a mountain village, but grew up on the streets of a coastal city. His involvement in drug trafficking led to the bullet wound that paralyzed him from the waist down. 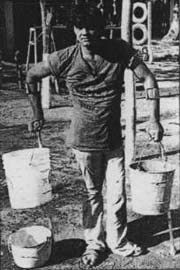 Angry and violent when he first arrived at PROJIMO, he became one of the most caring and capable workers there. (See Chapters 43 and 44. MARTÍN. 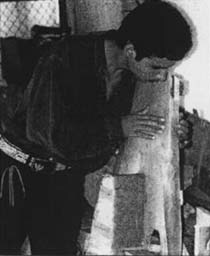 Martín Pérez, like Mario, grew up on the city streets in the subculture of drugs and violence. MARIELOS. If Rosa is the heart of the program, Marielos Rosales is the princess. Paralyzed in her lower body from a car accident, she was brought to PROJIMO for rehabilitation, then became involved in the toy-making shop, and now produces such beautiful play-things that she has more orders than she can fill. She also makes special seats, standing frames, and other wood and cardboard equipment for disabled children. When she does not have too much pain in her legs, she sings constantly and lifts everyone's spirits with her grace. 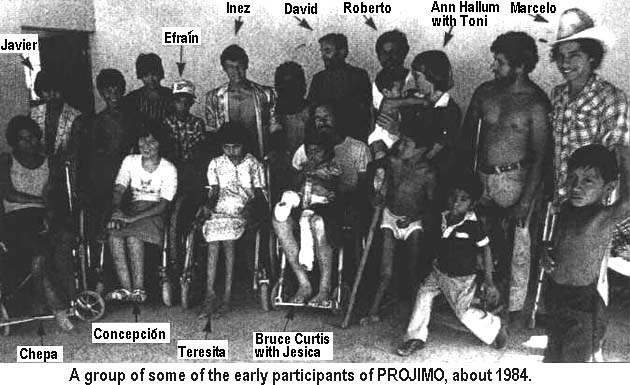 Other PROJIMO team members, past and present, who appear occasionally in the stories and/or photos are ROBERTO Fajardo (one of the founders of PROJIMO, p.90), MARTÍN Reyes Mercado (trainer of Child-to-Child activities, p.286), MARÍA DE JESÚS Leyva (toy maker, p.274), JULIO Peña (peer counselor, Chapter 28), JAVIER Valverde (brace maker and shoe maker, p.307), MANUELLA Campista (toy maker, Chapter 49), LEOPOLDO Leyva (wheelchair builder, p.259), JUÁN Morales (wood worker and brace maker, p.31), RAYMUNDO Hernández (brace and wheelchair maker, p.196), DON MIGUEL (handyman, p.201), RAFA (toy maker, p.279), QUIQUE (quadriplegic Spanish teacher, pp.3 and 282), and CHON (a deaf village carpenter, see pp.70 and 276). 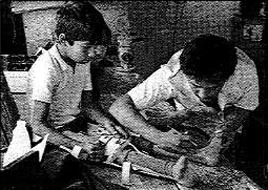 Village children who have volunteered consistently with the program and have helped to make assistive equipment include EFRAÍN Zamora (who has since grown up and helped prepare this book, pp.88, 126 and 292), ERNESTO Navarro (p.67), MARTÍN Reyes Millán (p.213), LLUVIA Nevárez (Mari and Armando's daughter, p.291 ), DIONICO González (p.330), and BIANCA (Cecilia and Inez's younger daughter, p.285). Skilled volunteers from North America and Europe who have helped to facilitate workshops at PROJIMO and cooperated with the village team in developing innovative aids and equipment include ANN Hallum (physical therapist, pp.137, 181, and 292), RALF Hotchkiss (wheelchair designer, pp.4, 148, 254, and much of Chapter 30), KENNETT Westmacott (director of People Potential in England, pp.33, 72, and 206), OLIVER Bock (brace maker, pp.82 and 88), JEAN ANNE Zollars (special seating expert, p.42), MICHAEL Heinrich (engineer and cushion designer, p.158), BRUCE Curtis (quadriplegic dancer and peer counselor), and MONICA Rook (occupational therapist, p.45). Some of the many other volunteers who have made important contributions but are not specifically mentioned in the chapters are included in the Thanks page in the front of the book. Note on the use of personal names in this book: Most names used for the disabled children and adults in the stories are their real names. However, to avoid confusion, we have occasionally used different names for persons with the same names. We apologize for any confusion.